NEW MUSICAL of the famous love story of beautiful gypsy girl Esmeralda, scorned bell-ringer Quasimodo and the dashing Captain Phoebus, set in 15th century Paris. For the first time two masters of stage and screen, composer Alan Menken (The Little Mermaid, Beauty and the Beast, Newsies, Aladdin) and lyricist Stephen Schwartz (Wicked, Godspell, Pippin) join forces to adapt this time-honored story for the musical stage. The music's orchestral power and choral beauty, along with bold and dramatic theatrics create a powerful rendition of this timeless tale. While this show is based on the animated Disney film and includes many of the same songs, the plot and themes follow more closely to the original, and significantly darker, novel. 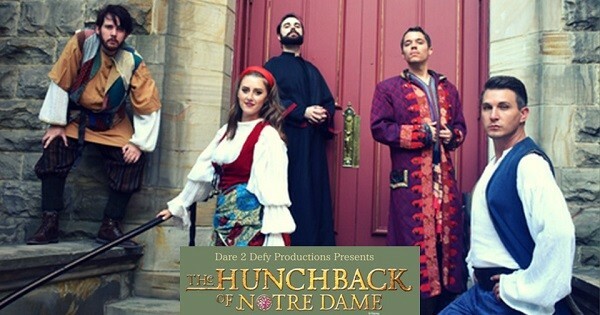 Find more events like "Hunchback of Notre Dame"
Entertainment Production company presenting customized entertainment for parties and events, dinner theater and large fully staged theatrical productions - featuring professional talent!